How does one find themselves banging their head to a band they barely know speaking in a language they don’t know at all in one of Germany’s lesser traveled to cities with someone they’ve only met once, briefly? It was a product of several wish list items coming together at once with a dash of craziness and impeccable timing. I travel a lot domestically but I hadn’t been out of the country in almost 7 years. I knew that was part of my soul searching year of crossing off things on my bucket list; I needed to get out of the country. I was all set to plan a voyage to Egypt, Tunisia, and Morocco that I’d been dreaming of forever, but political reasons and the controller of a large source of my funds, my father, dictated that this wasn’t the best time. One of my other top travel destination desires was Norway, and coupled with the need to visit Italy again and see friends in England, my trek over to Europe started to take shape. Somewhere along this time an acquaintance who graciously took me to Rammstein in New York last year (my number one show of the year) sent me an interesting email. When I first read it, I thought it’d be crazy for me to do, but those that know me know that I can talk my way from crazy to fun and exciting faster than a Ferrari can hit 60. After weeks of planning I had myself an- I’ll even admit it- crazy itinerary taking me across Italy, Germany, Norway, and England over about a one month period, only spending more than 3 nights in the same place once and skipping some festivals that “I should be at” by a few days. At slightly over a week into my journey, I was stepping off a train to walk into a small arena. I was teeming with excitement upon seeing ‘my people’ gathered outside. Just like most of Europe, it’s enough like America that on first inspection it looks very similar, but then a closer look reveals that it isn’t at all. Like the coffee. Or ice cream. 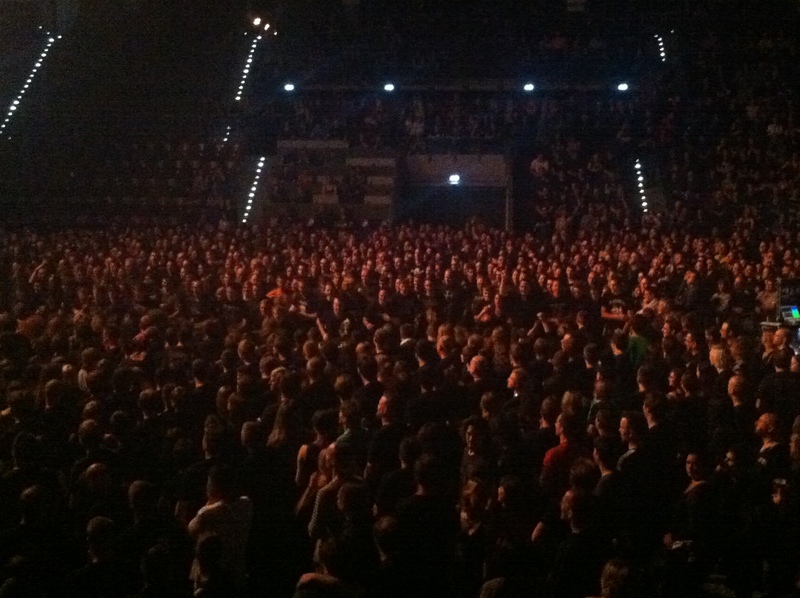 So the crowd looked like my people, the metalheads I stand with at shows every week back at home. They wore the same shirts: Motörhead, Slayer, Metallica; they have the same patched denim vests, they have the same penchant for black. But they’re outside drinking beer, they’re wearing kilts, they’re in much larger groups. Fiddler’s Green is already in stage as we find our seats. We’re right above where players would walk out onto the court, so no one is really in front of or behind us. The place is full of a captive audience already for the opener. The first though that came to my mind while watching this opening set was that music is a universal language. When they played, I could understand everything, but when they talked, nothing. 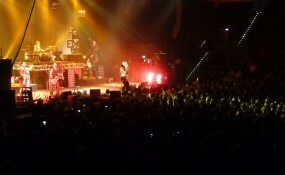 The music was heavy enough to be metal, but the mood was light, the crowd was happy, and the level of showmanship, high. During this set I watched the longest, most organized, and friendly crowd surf of my life, where the surfer got up in the front and then was taken in a near straight line allllllll the way to the back without being tossed along the way. Somewhere between Fiddler’s Green and In Extremo and watching the crowds, I realized that the crowd is way more into participation and the sense of a communal experience here than in the US. I think that, as Americans, we are often too independent for our own good. The way that most live in Europe fosters a greater sense of community, and that carries over into the concert experience. There’s this back-slapping, let’s drink together and have a good time attitude that is on a whole different level than what you see in the US. It’s not, ‘what am I going to get out of being here’, but rather, ‘what are WE going to get out of being here’. Fiddler’s Green continued on with their ‘speed folk’, at one point turning off the lights, revealing the fiddler to have a bow that lit up, and a few other instruments as well. 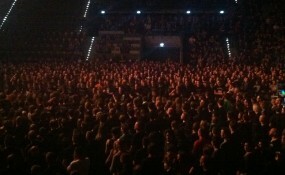 They had the crowd separate into a very organized and somehow civilized Wall of Death at one point. As they left the stage, the crowd gave them a send off worthy of the headliner. Between sets, I’m noticing all the families around me, even taking a picture for one sitting next to me. This is unheard of at American metal shows, with the only exception being maybe Metallica. The show started off with a bang…literally…this giant flaming spear flew from the back of the stadium to the front rafter of lights and exploded; honestly I thought something was wrong, but that’s just how you begin things for In Extremo, I guess. 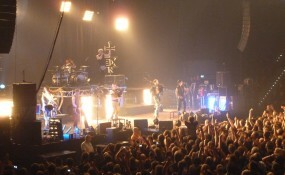 The curtain reveals the band in their industrial meets medieval metal attire. It takes me a bit to take synchronized bagpipes seriously, but by the end, I was kind of digging their antics. The lead vocalist struts about the stage like the contemporary metal German version of Mick Jagger. He speaks to the crowd often; to me it sounds like he’s scolding them, but by their reaction I can tell they like what he is saying. There was a lot of putting hands in the air and clapping, and everyone did so as one unit, except me. I was too busy waiting for more pyro. 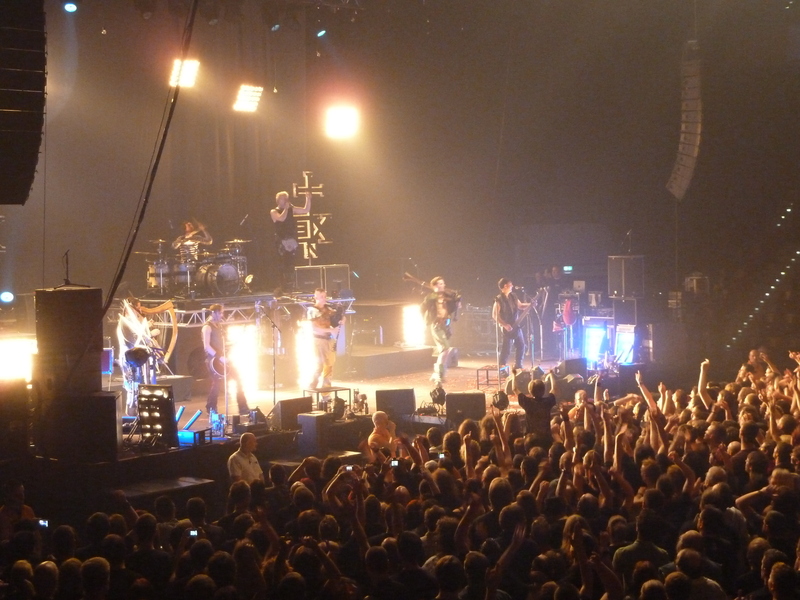 The pyrotechnics, while not coming close to a Rammstein show, were a welcome addition for me since I rarely get to see any. I watched how there were a few mistakes in the show that I could figure out, mostly by watching the pyro guy’s reaction to the vocalist giving him ‘the look’: he’d shrug his shoulders and put his hands up in that ‘I dunno’ way. I generally am pretty tuned into people’s nonverbal communication, but one week into a land of foreign tongues and I was really reading into all of it. The band played for close to two hours, and EVERYONE stayed until the end; considering most people travel by train there, I thought this was incredible. I have to admit that a lot of the time while I was watching this set I was absorbed in the thought that I wish our audiences gave this much to bands in the US. 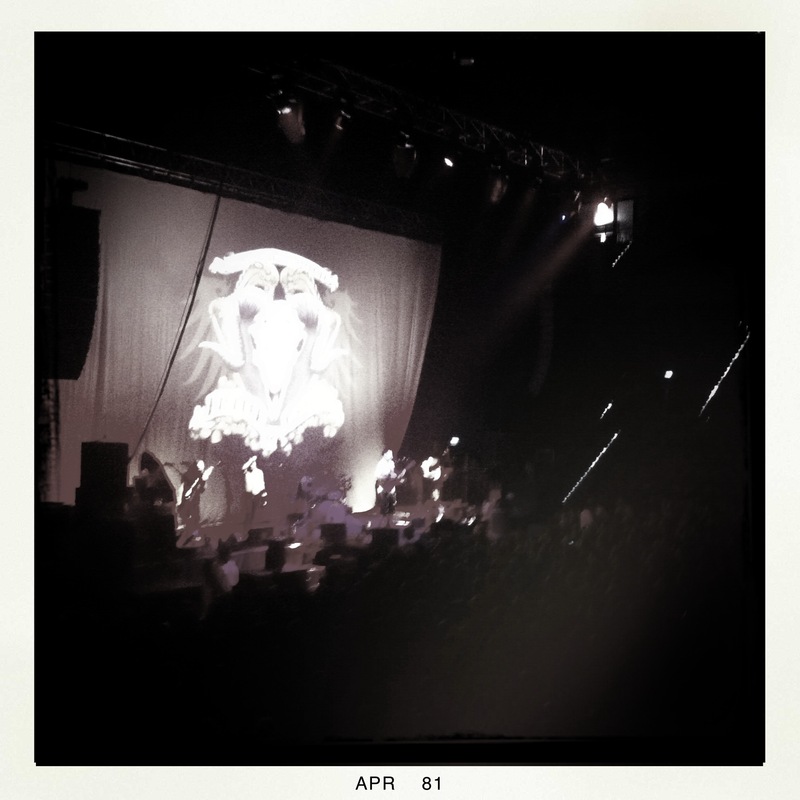 I’m really glad that this was my first non-US show- a big arena affair with all the bells and whistles…because the rest of my trip throughout Europe I’d work my way into seeing smaller and smaller gigs. At the end of the show, I marveled at how you could walk outside with your beer and finish drinking AND grab food from several vendors who were set up outside. AND they took their beer on the train with them after! Any German reading this will probably laugh at how novel this whole concept was to me, but I found it incredible. They know how to have a good time.